Raye loved playing dress-up so much, she studied costume and makeup for her BA, then got an MFA in surface design. Making your own fairy wings can be a fun project to do with kids, or a great way to get the exact look for a costume you are creating. 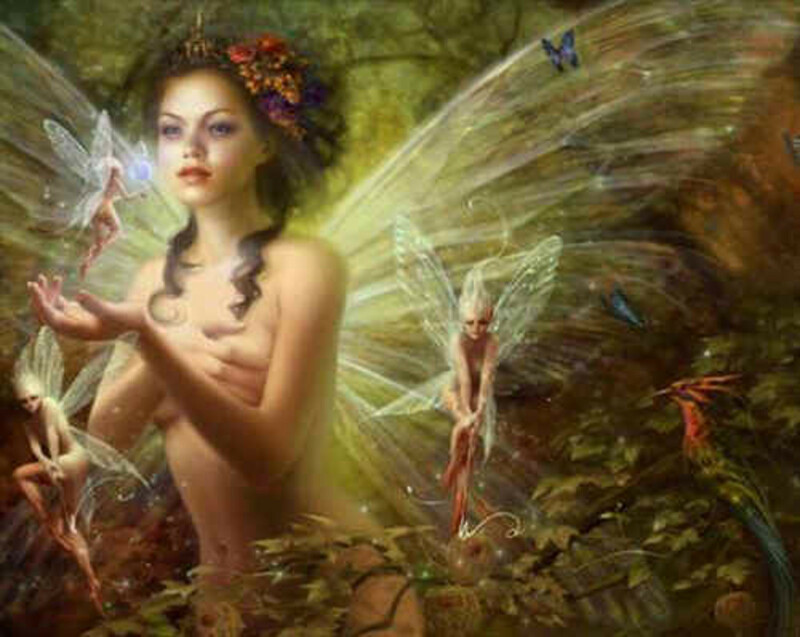 The definition of fairy wings has grown beyond just simple fairies to encompass all sorts of wings with variations existing that are appropriate for angels, butterflies and gothic bat wings. And they've gone beyond just being a Halloween feature. 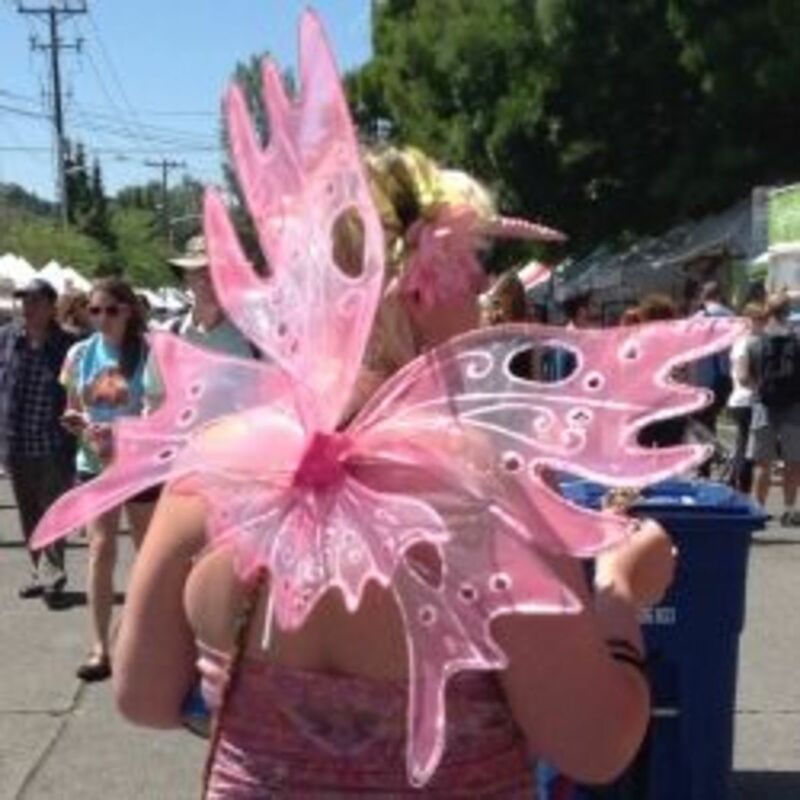 Fairy wings are good for dance clubs, spring festivals, rainy days and Burning Man. You can't go to a sci-fi or costume convention without seeing dozens of variations. And I've even know of a bride or two who made fairy wings part of their wedding dress. The biggest fear most people have when it comes to the idea of do-it-yourself wings is having to sew. FEAR NOT!... What you'll find here are some great "no-sew" ways to make your own fairy wings! Tips for the design process and getting ready. Needs wings really fast? Here's how to do them when you need something super-quick for a once-off party or occasion. For when you want some wings and are willing to invest the time and materials, but you still don't want to have to sew them. The very first thing you need to do before you start making any wings is to decide what they are going to look like. This lets you plan everything else that comes next and will help you figure out just what you can do with the time you have to make them and what sort of budget you will need. Wings do not have to be expensive unless you aren't willing to settle for something that can only be made expensively. Sit down with some blank paper, your preferred drawing tools (pens, pencils, crayons) and make a really rough sketch of what you want the wings to look like. Don't worry about exact sizes just yet, but give yourself a good idea of the wing shape, colors and any patterns. You may find you have to spend time online or at the library looking at books full of pictures of butterflies or illustrations of faeries before you can make up your mind. How many times are these wings going to be worn? How sturdy do they need to be? Will they be worn inside or outside? Based on your answers to yourself, it will start to give you an idea for how simply you can make your wings, or not. If you need to be outside and it might rain, you don't want to make wings from tissue paper but cardboard sprayed with a waterproof sealer might get you through a one-day event just fine. 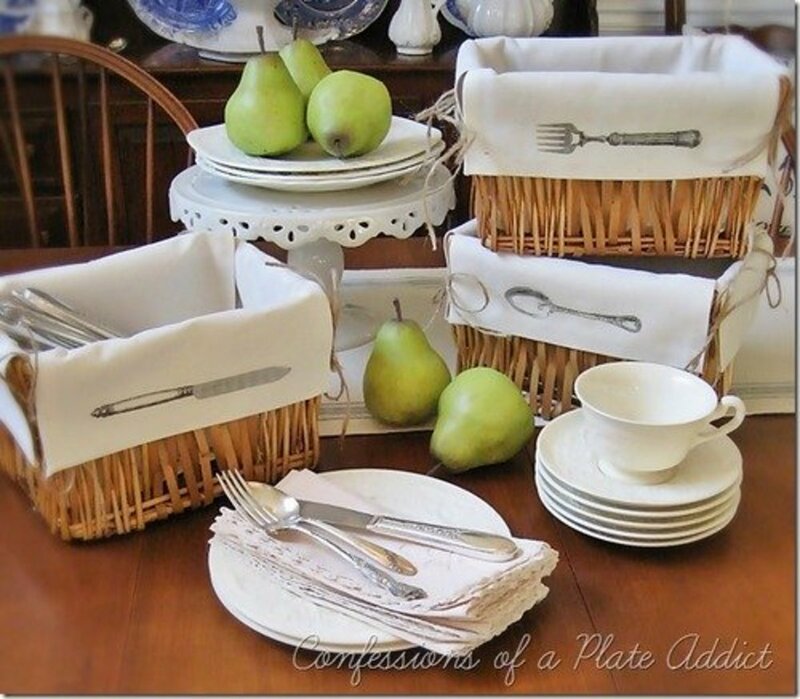 If you are going to wear them once and then just get rid of them, making them out of thick paper or tissue glued over thin wire might be the quick-and-cheap option you are looking for. There are a couple of ways to make fairy wings for those of you in a hurry or who don't have too much in the way of sewing skills. The basic things to think about are how durable you want your wings to be, how big do you want to make them and how many times are they going to be worn. 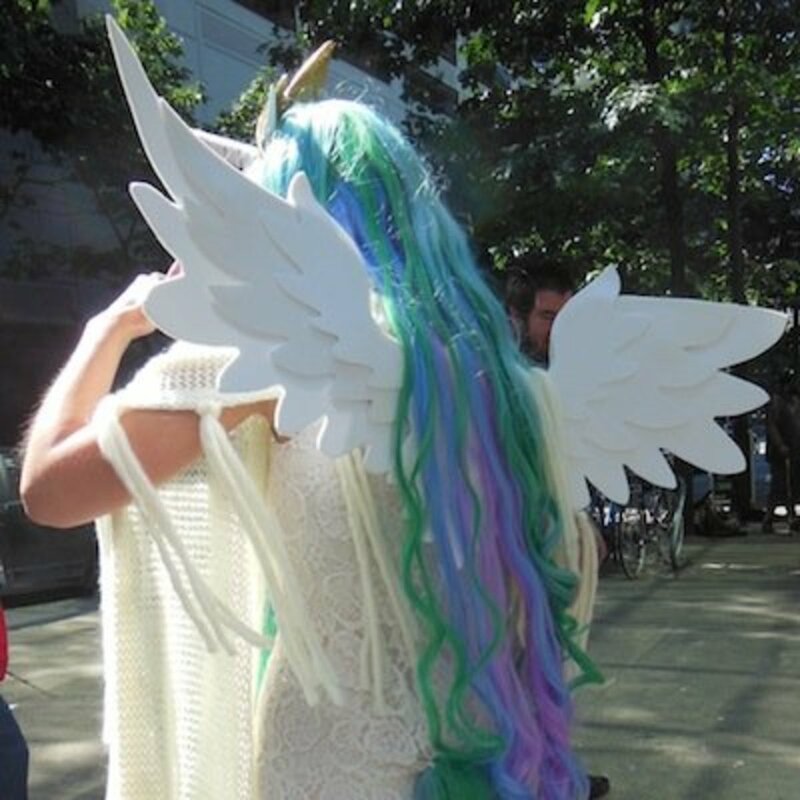 If you need wings for a one-time-only costume or event, there are a number of ways to make them very quickly and often using materials that you already have on hand. If you need quickie wings for an event or party, you can make them from paper or cardboard and just decorate the surfaces. 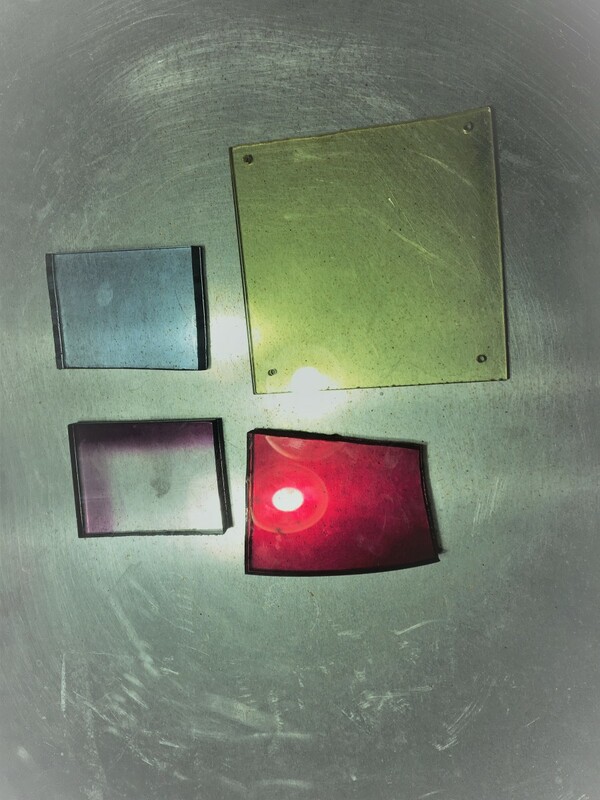 Large pieces of oaktag (manila folder paper) can work. You can find rolls of this material at better art stores. You can also use the sides from big cardboard boxes (to get larger, quickie pieces). For good colors that you don't have to paint and something that wears really well in public, try to find large sheets of flexible craft foam. You can tape the wings together to make the spine (try brightly colored duct tape), and then add some string, elastic or fabric straps to wear them. If you don't want the spine to be completely flexible, a short piece of 1" PVC pipe can be used. Measure from a few inches below your neck to a few inches above your waist to determine length. 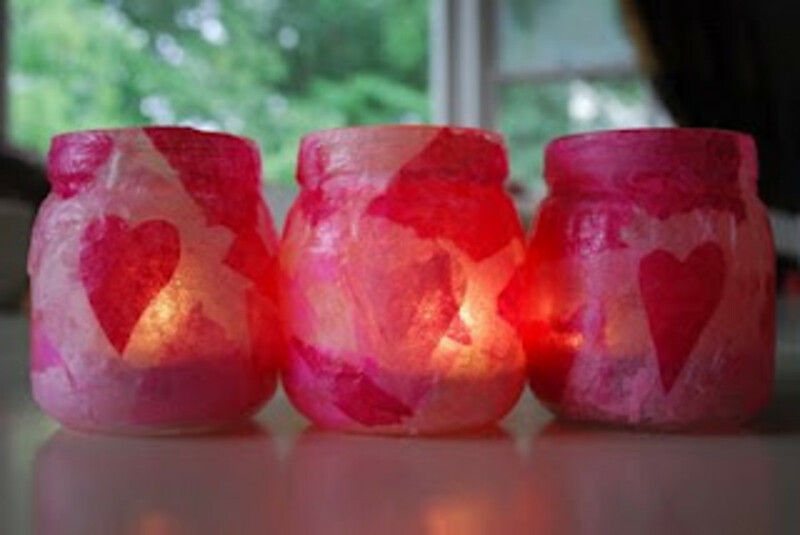 Cut as needed and sand the edges smooth or tape over them with brightly-colored duct tape. Tape the wings to the spine and then decorate everything to match. If you'd like to make larger and more elaborate fairy wings, here's a great method for making shiny, iridescent wings using cellophane or even sheet plastic. For these wings you'll be using glue instead of sewing. Start with some 14g or 16g wire. You can make the outline of your wings, or you can also make some veins and curls for inside the wing. I wait until I've got each wings covered before I attach them to each other as it makes it easier to work on them and lay them flat at this stage when they are unattached to each other. For glue, I like to use a strong craft glue that dries clear. Other good options are colored glues that match your wings, or glue with glitter in it. Make sure the glue works on plastics and metals so that it will hold the wings together. Do not use hot glue if working with cellophane as the heat of the glue will melt the wing material. Lay out one wing form and carefully apply a thin amount of glue to the part of the wire that is facing up. Gently lay the cellophane material over the glue so that the wing has a skin on one side of it. Turn the wing over so that the cellophane side is now down and the wire side is up. Again, carefully apply the glue to the wing wire and then lay a second piece of cellophane over that. You have now sandwiched the wire forms in between two layers of cellophane. When the glue is dry, carefully trim off any extra cellophane so that your wings take shape. If you make your wire forms very elaborately, sometimes you can even trim away interior shapes and spaces to make cut-out in your wings. Tape or glue the two wings to each other to make a "spine" and add straps for wearing. If the wings are made to be worn with a corset or a tight bodice, you can make the spine part so that it slides into the garment and holds the wings on without shoulder straps. Now you can add any glitter, feathers or other decorations to your wings if you want. 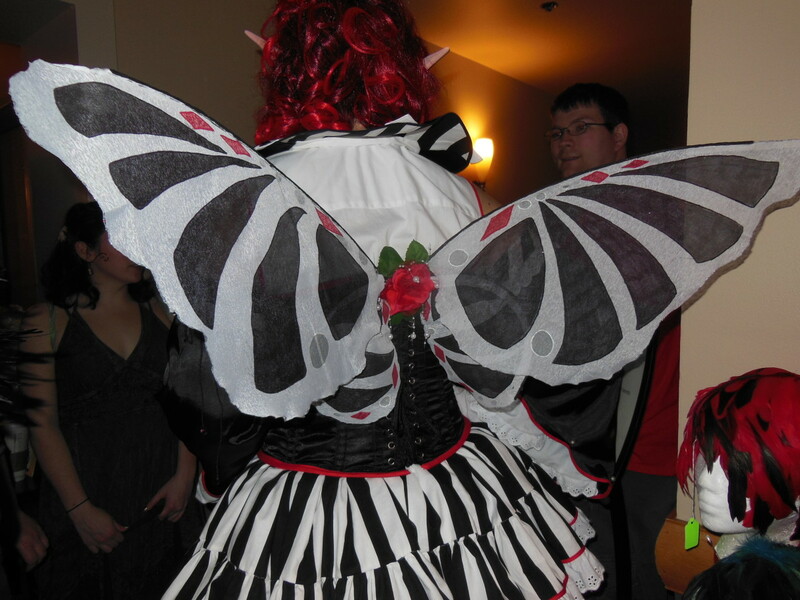 The most essential part of any fairy outfit, costume or persona is a pair of wings. 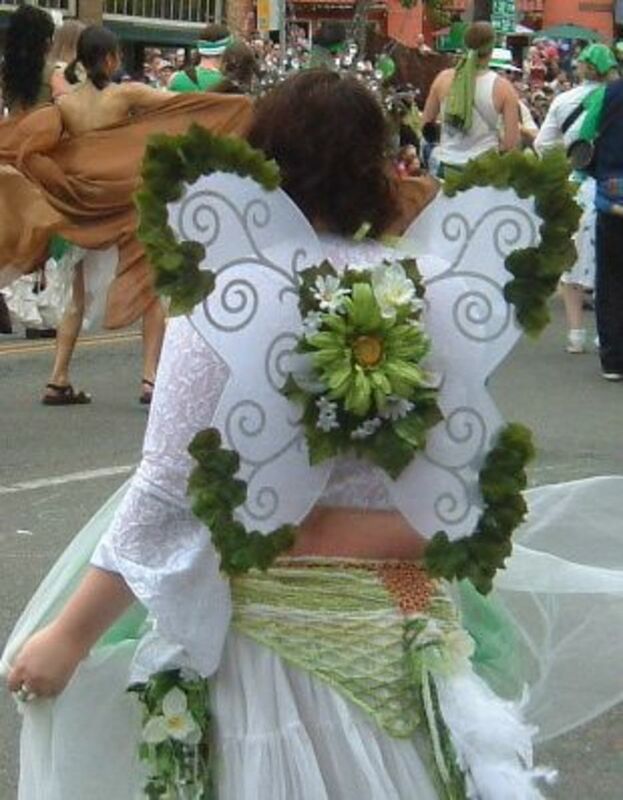 Fairy wings are good for costume parties, conventions, gatherings, street fairs, parades, Halloween, May Day festivals, stage plays and rainy days. Children will love making these wings for their Halloween costumes. Printable PDF with design and instructions. 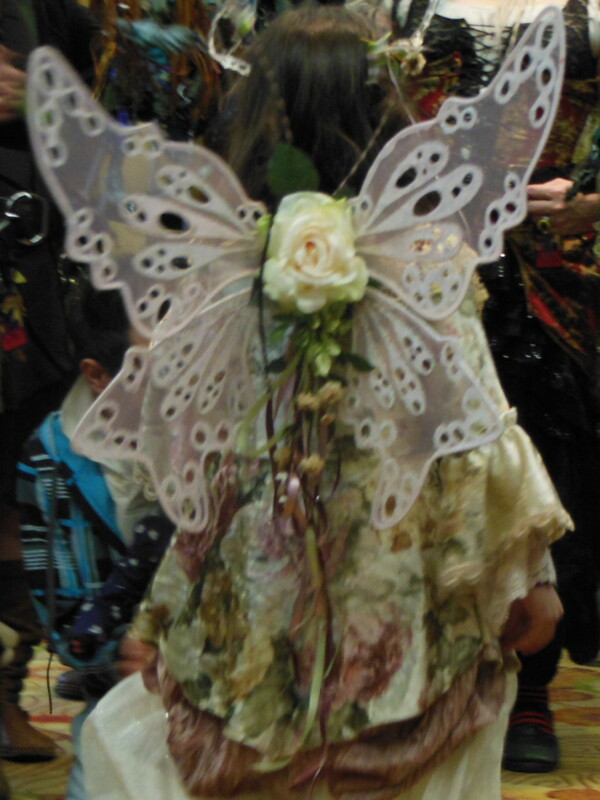 Easy directions to create your own Fairy costume and the biggest selection of Fairy costumes available. There are many ways to make fairy wings. This is the affordable version. Make your own fairy wings for the May Day Festival! With a few basic supplies and your own creative spirit, you can make your own fairy wings to wear to the May Day Festival... or just to flit around town! Follow the instructions below, or, just wing it. What sets your wings a-flutter? Hillary, meeting fairies is pretty different from just making wings, but here's no reason meeting Faeries has to ruin your life. What a great Hub! Especially this time of year. I've been to an anime convention in Maryland about 12-13 years ago now it seems. This was unique! 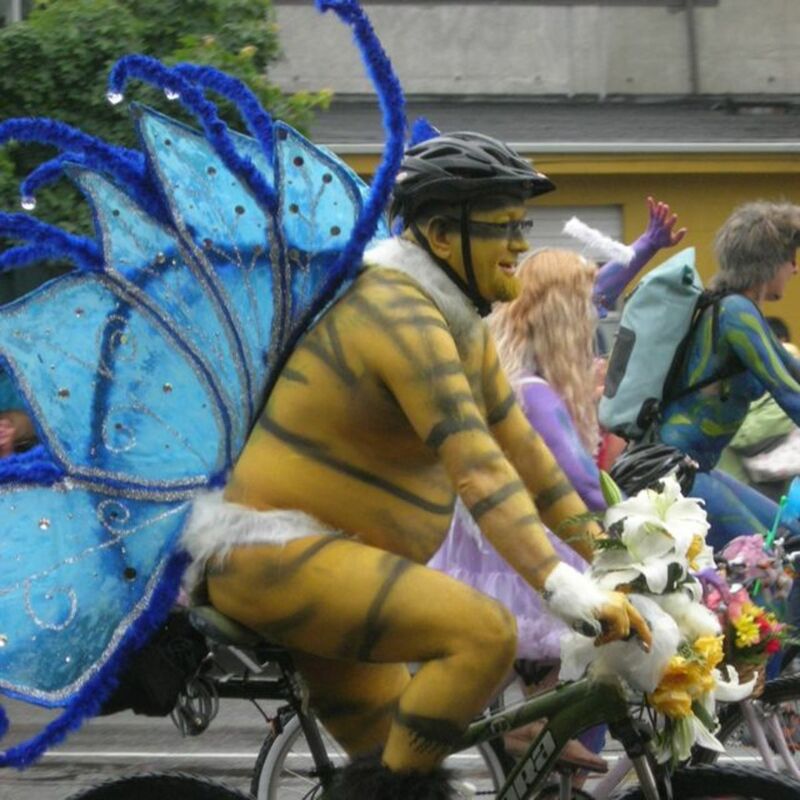 Although I love the Victorian style wings in the very top photo, I do have to admit that the fella on the bike did something special for the wings he was wearing. That looks like a very fun event you attended. Voted up and more, plus sharing. Excellent hub. Great info. Thank you for the easy directions and for sharing your talent. I LOVE FAIRY AND WINGS TOO! Awesome hub! Thank you for sharing the DIY fairie wings! Darn and I see people spend tons of money on wings every year at the Halloween costume store! thehands, that depends on the power of your imagination, doesn't it? I reckon you can't actually fly with these, right? The fairy wings in the picture looks complex and great! hey i say that i love those wings! Even tho' I appear to be mostly hardware/science oriented. I actually find this interesting for insect construction. Good alternative knowledge all compiled and ready to guide. I do have a creative side (trying to indulge it more). 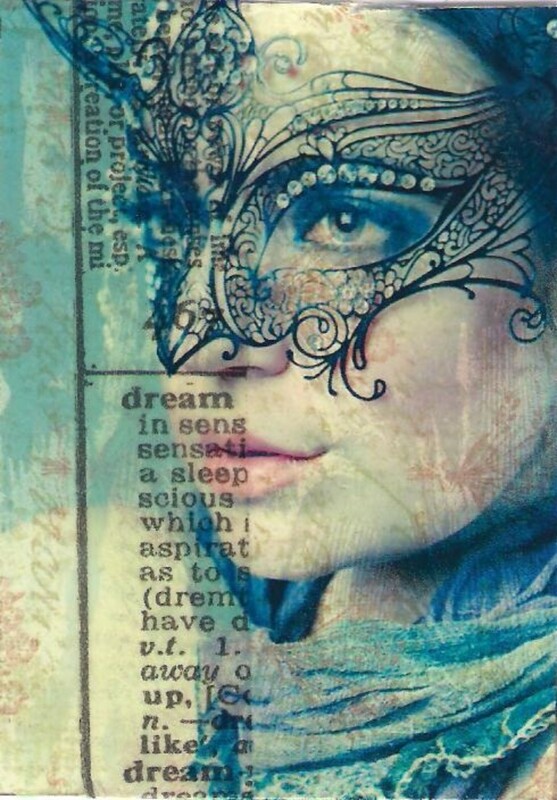 Today I'm going to Home depot to check materials for special Aspen-wood gift boxes, and decoupage. So I always try to look for other craft sources and alternative material usage. For instance your wings would be great on a gigantic butter/dragon-flies. very nice hub. I love doing these little projects with my nieces and they will love this one. Thank you for the easy directions and for sharing your talent. Great hub! The links are awesome, too. This hub is bookmarked! Thank you for this excellent hub! I have 2 girls ages 4 and 6 who love wings and wands. If you have any tips on making magical wands that would be a great project too.Thanks again, can't wait to make these wings with my fairy princesses. What a great resource! My wife and I have been looking for ideas to make custom fairy wings for our daughter. Thanks for sharing. Great hub! very useful information. I'll reall try it for a fun. Thanks for these great ideas! I'll be referring back to them for an upcoming project. thanks for the video on fairy wings. great detail, was very helpful. thanks again. When I travel, I'm always looking up my Hubs for info, especially recipes! Relache, you always have the coolest hubs. I bookmarked this one, actually. Wow, that's great, and how appropriate for someone named &quot;EarthAngel&quot; too! Thanks Relache!! My church has asked me to be the Angel this coming Christmas Eve and I need to make a set of wings!! Thank you for sharing!! I will email you photos!! Blessings, Earth Angel!! These are great thank you..